Welcome to 725 Nipigon Trail in Maple Leaf Golf & Country Club. 2005 26'x40' Scott Built double-wide manufactured home situated on 4845sq ft perimeter lot. 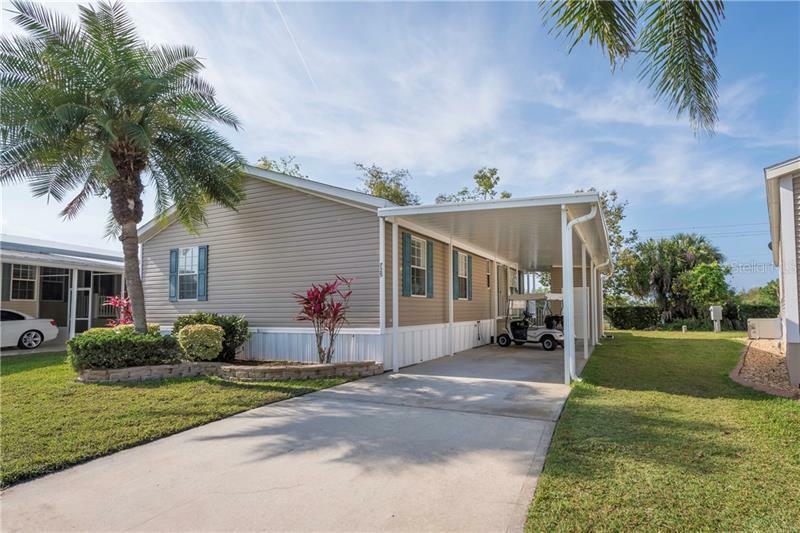 You will enjoy the Florida weather on the 26' wide covered back deck. Interior floor plan includes living room dining room combination kitchen with oak cabinets master bedroom with en-suite bath with walk-in shower guest bedroom and guest bath with tub/shower combination interior laundry. Covered parking for two cars. Storage Shed. Sold furnished with Golf Cart. AC replaced in November 2016. Located in an award winning resident owned 55+ gated golf course community with an active resort lifestyle. Features a par 62 18 hole golf course 5 tennis courts bocce ball lawn bowling 2 shuffleboard court centers 4 heated swimming pools 2 hot tubs fitness facility woodworking facility 75+ clubs/activities 2 pickleball courts restaurant with full service bar and more. One dog is allowed at this lot location. 24 hour gated community. It's true what they say It's all about the lifestyle in Maple Leaf. Price includes $40000 share. Monthly fee due to Maple Leaf of $238.